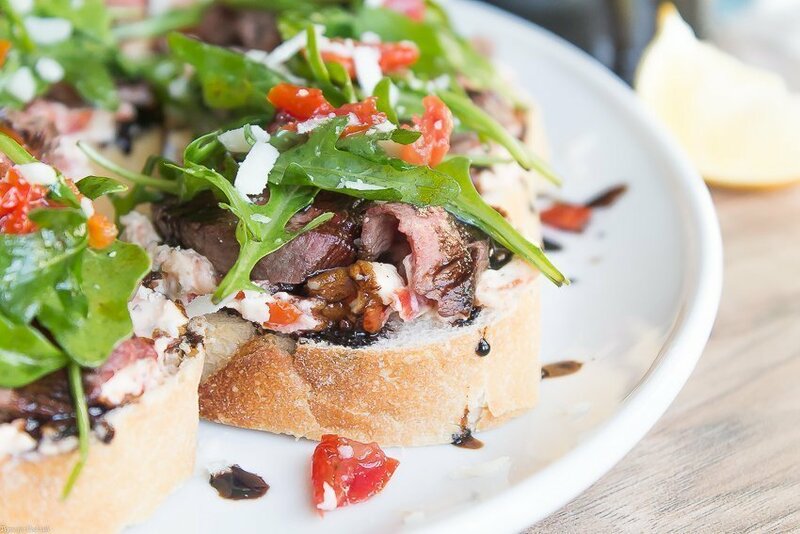 You will delight guests with this elegant recipe for Balsamic Steak Crostini at your next home happy hour. 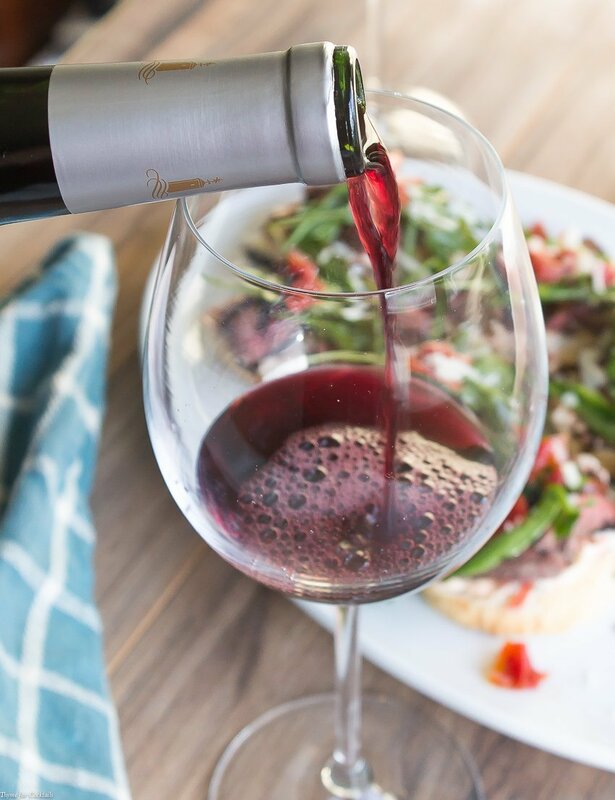 Serve along your favorite wine for a tasting that is a little bit homemade, a little bit convenience, and a whole lot delicious. When Paul and I decided to move to Ohio last month, we immediately received invitations from friends and family to spend time together before leaving Arizona. It was completely natural to have intimate gatherings at home, where we could really talk, as opposed to going out for happy hour since everyone knows food and cocktails are my forte. Friends started popping in and out of the casa pretty much the moment we made the announcement. And many of them didn’t call ahead! 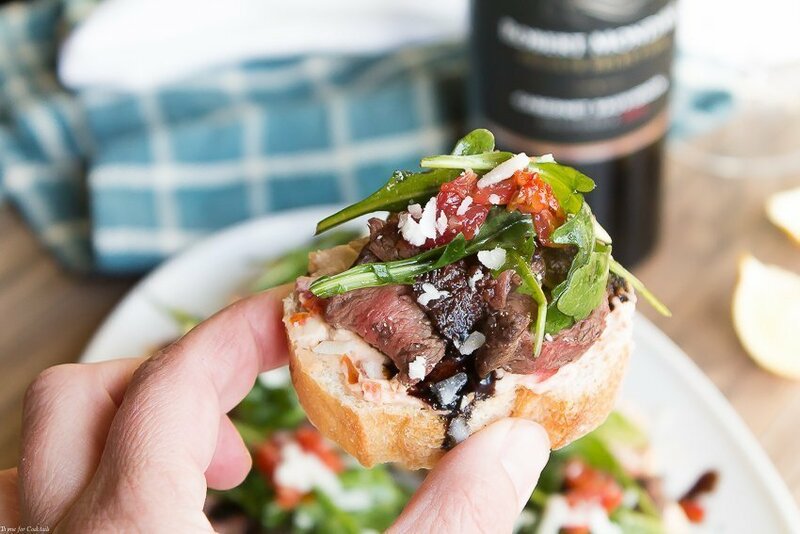 Luckily, I have simple recipes, like my Balsamic Steak Crostini, that are very easy to make in a pinch. I immediately stocked up on Robert Mondavi Private Selection wines after the first evening of unexpected guests, so we’d be fully equipped to entertain last minute. The bold and high quality flavors of these wines pair wonderfully with a variety of appetizers. While their new look is a reflection of their high standards and legendary winemaking expertise. My favorite appetizers are ones which have a mix of store-bought and homemade ingredients. The most difficult aspect of this recipe is the balsamic reduction. And that is pretty easy to make. 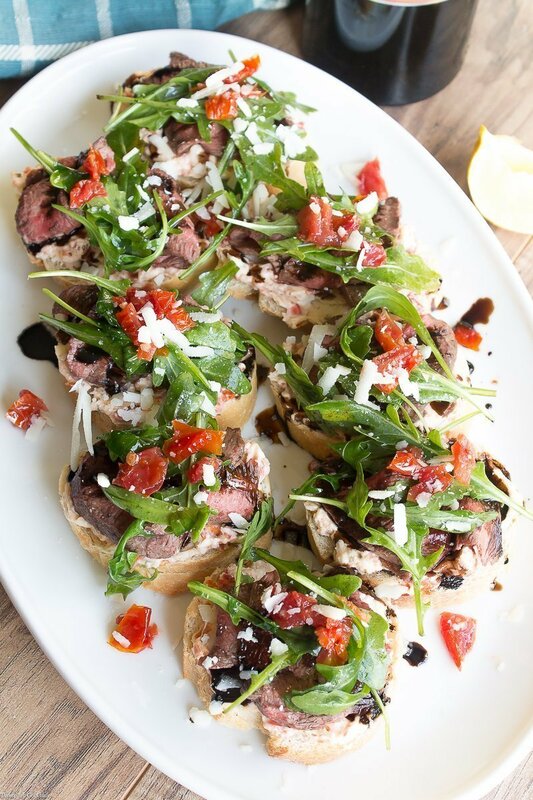 It is simply balsamic vinegar that has cooked down until it is slightly thickened and syrupy. That’s it folks, really! The trick is watching it closely so it doesn’t reduce too quickly. 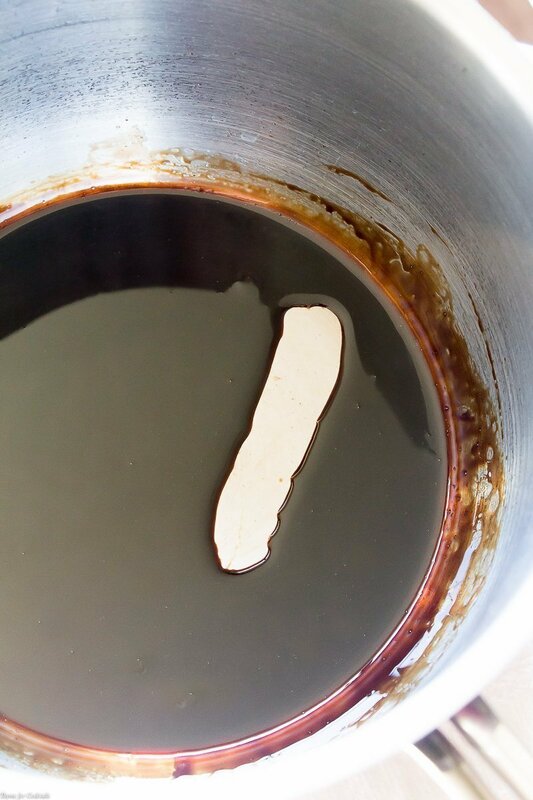 Add a 1/2 cup balsamic vinegar to a heavy bottomed saucepan, and bring to a low boil. AS SOON as it starts to bubble, reduce the heat as low as you can. Let it simmer for 5-7 minutes, stirring frequently. When the syrup separates like below while you stir, it’s ready. Let cool 1-2 minutes and you are good to go. Drizzle it over appetizers like I did here, or try it on ice cream for a sweet treat your friends will love! We like steak medium rare, and a flank or flatiron is the perfect cut for this recipe. Cook to your own preference, then slice super thin. Furthermore if you are in a real bind, you could even substitute rare roast beef for a similar taste. 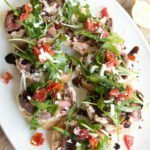 The only other part of this recipe you need to ‘cook’ are the crostini, unless you buy pre-toasted ones from your local deli. I like to use a nice Italian baguette, cut into 1/2 inch slices. Lightly toast the bread so the outside is slightly crisp, but the inside is still a little soft. 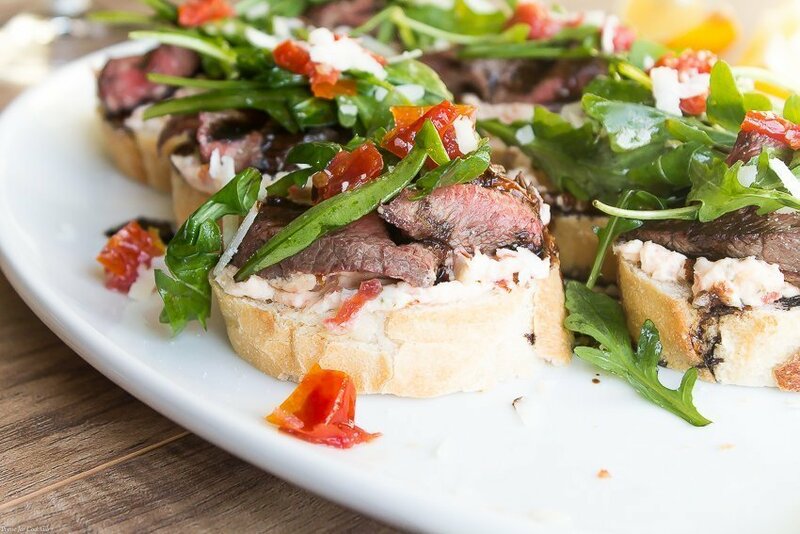 The spread is a combination of herbed goat cheese and diced sun dried tomatoes, both great prepared ingredients with a ton of flavor. I like to add extra tomatoes as a garnish for a pop of color. Just be sure to reserve the oil from the tomatoes, which is tasty shortcut when it comes time to lightly dress the arugula. Just drizzle over your greens, add a squeeze of lemon juice and toss to coat. 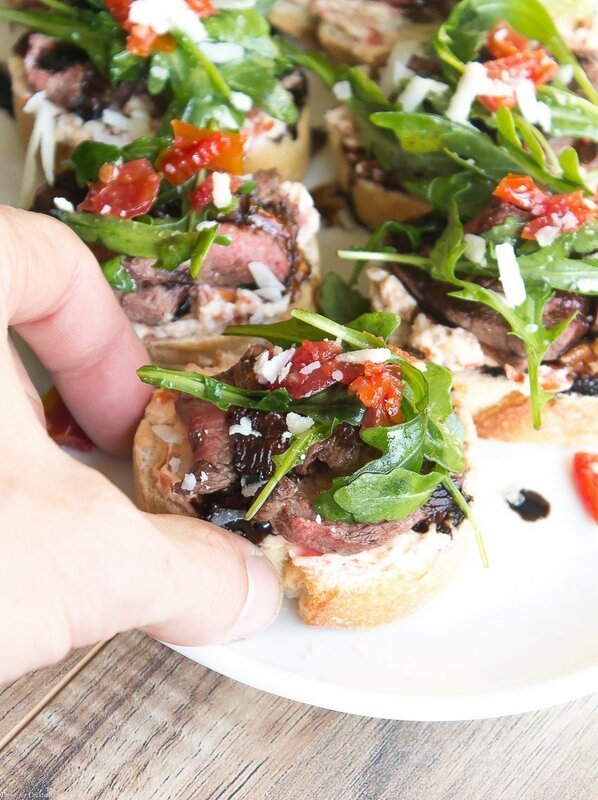 In other words, these Balsamic Steak Crostini are easy enough of a relaxed happy hour at home, but elegant enough for date night, or even a red carpet viewing party with your girlfriends. Paul and I enjoyed them for Valentine’s Day, along with a glass of Robert Mondavi Private Selection Cabernet. My husband is a fan of ANY snack with red meat in it. As a result, he now requests this appetizer recipe for every occasion. What is your favorite appetizer to create at home? 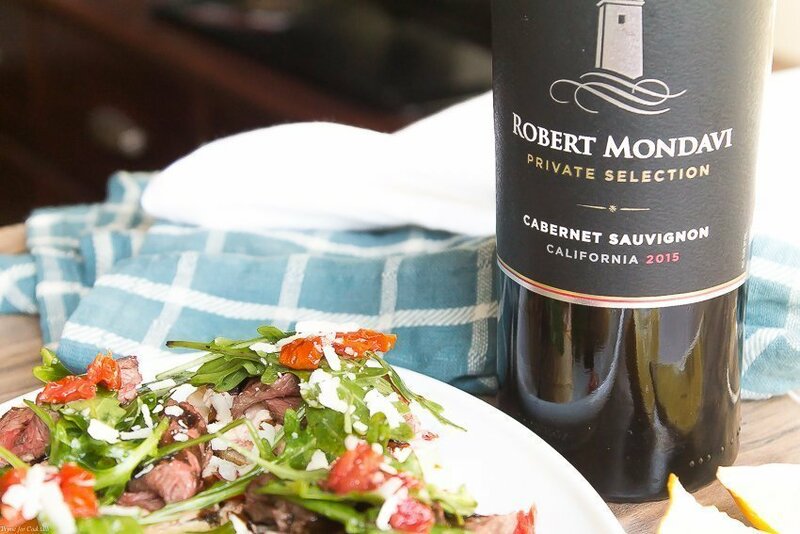 Which Robert Mondavi Private Selection wine do you like to pair your recipe with? Share your thoughts in the comments! 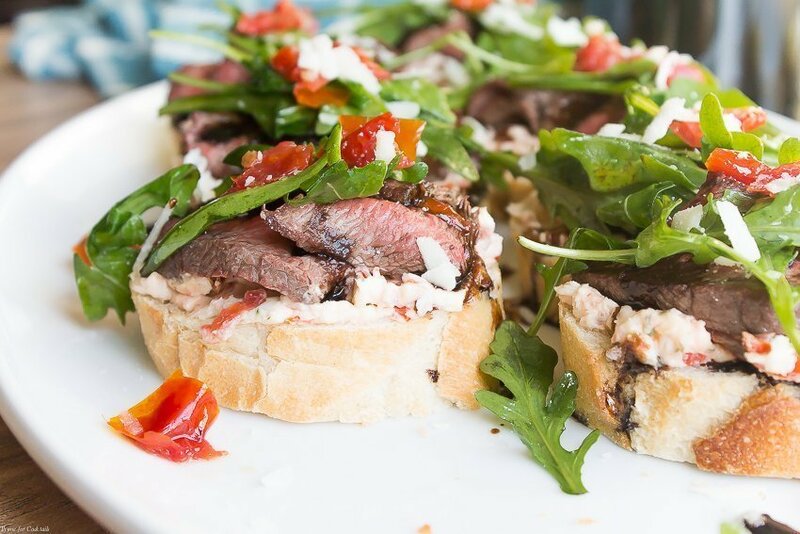 Toasted crostini spread with sun dried tomato goat cheese, topped with tender pieces of marinated flank steak and a drizzle of balsamic reduction. Finish with lightly dressed arugula. Preheat oven to 350 degrees. Place bread slices on a large baking sheet, drizzle with 2 tablespoons extra virgin olive oil. Bake 10-12 minutes until slight crispy. Remove and set aside. While bread toasts, heat a large cast iron or non-stick skillet over medium high heat. Lightly coat skillet with remaining olive oil. Generously salt and pepper both sides of the steak. Add to pan, cook 3-4 minutes per side, or until meat reaches desired doneness. Set aside to rest for 5 minutes, then slice in thin pieces. In a medium bowl mix together goat cheese and 3 tablespoons diced sun dried tomatoes. Add arugula to a small bowl, drizzle with reserved oil from tomatoes. Squeeze half a lemon over greens, toss to coat. Evenly spread cheese mixture on toasted bread. Top with desired amount of steak. Drizzle with balsamic reduction. Place dressed greens on next, garnish with remaining tomatoes and sprinkle with grated cheese. Serve warm or room temperature.